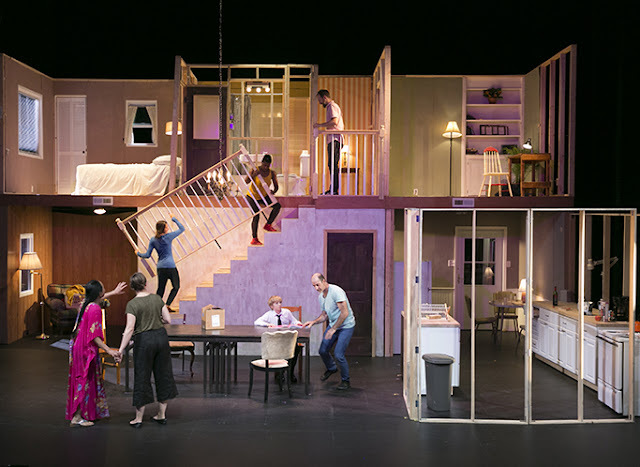 ArtsEmerson's latest offering, Home, begins on an almost-bare stage, gradually evolving into a structure that will shape and shift with its depiction of successive inhabitants over an unspecified period of time with virtually no dialog. In so doing, it intentionally and ingeniously blurs the differentiation between theatrical forms, ultimately defying conventional categorization. 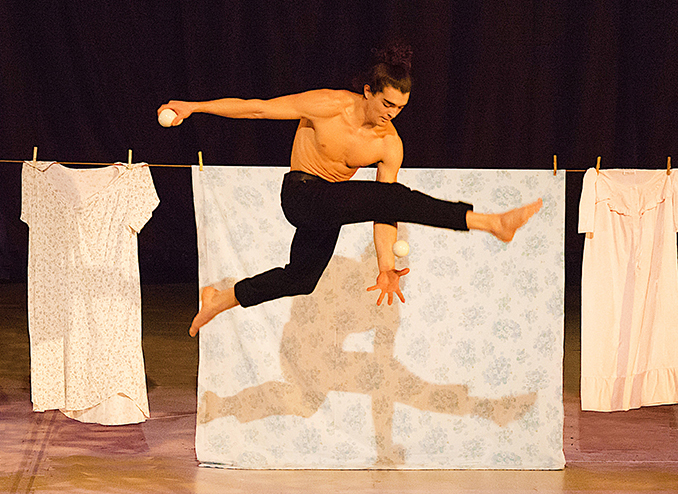 It's part performance art, part mime, part art installation, and part traditional theater. Created by, and featuring, Geoff Sobelle, in collaboration with his talented group of performers Sophie Bortolussi, Jennifer Kidwell, Elvis Perkins, Justin Rose, Ching Valdes-Aran and Josh Crouch, it's your dream fantasy of a house party, with more than enough heart to make this house a home. As performed at the Robert J. Orchard Stage in the Paramount Center, it's enough to banish any thought of taking HGTV seriously again. The work, as Sobelle has noted, is dedicated to the “sublime ridiculous”, and he suggests we hang onto our seats (almost literally) while we temporarily inhabit them, a worthy metaphor for the transitory occupation taking place on stage. As the company of seven (or perhaps more?) 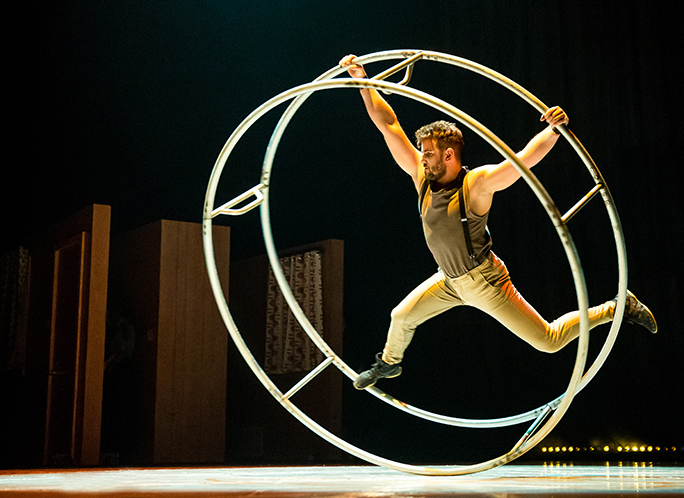 depicts the cyclical goings-on, one can't help but marvel at the subtle rhythms of life being presented, under the painstakingly timed guidance of Director Lee Sunday Evans and, even more crucially, the exquisite harmony conducted by Choreographer David Neumann. It makes for a visually overwhelming display of comic precision (reminiscent of such previous pieces of theater like Noises Off or parts of A Funny Thing Happened on the Way to the Forum), culminating in a virtuosic Pandora's Box of pure magic. With elegiac Original Music by Elvis Perkins, the spectacularly functional Scenic Design by Steven Dufala, multifaceted Costume Design by Karen Young, complex Lighting Design by Christopher Kuhl and split-second Sound Design by Brandon Wolcott, it's a technical marvel from start to finish, often as the result of the contribution of Illusion Consultant Steve Cuiffo. While it takes its own tantalizingly languid time to get started, once the house (and the play) fully take shape, it has an almost non-stop flow of meticulous joy (and sometimes sorrow) as it takes us on an unpredictable and involving ride through the life and lives of the structure we witnessed grow and prosper. In a few brief instances, notably when audience members (or were they?) get involved, less disciplined bits threaten to go off the tracks. Not to worry, however, as this team ultimately has everything well in hand. It's difficult to convey how incredibly moving it can be to watch the recreated memories of what a house can contain, from birthdays to weddings to wakes. It's all over in a swift ninety minutes, and seems to end just when and how it should; like the reconstructed and deconstructed set in which it dwelled, its work over, the shared experience has been wise and witty, hearty and hilarious, lively and life-affirming. The excitement will be building through October 1st. Stephen Spinella & Dan Butler in "WARHOLCAPOTE"
Back in the late 1970's, Andy Warhol and Truman Capote got together and decided they were meant to produce a play destined for Broadway. They recorded themselves over a period of several months in a series of conversations intended as the framework for their proposed piece of theater, but, for whatever reasons, such was not to be, until director Rob Roth came across the tapes of those conversations. There followed a decade of unearthing those recordings (there would prove to be almost sixty of them, each ninety minutes long, a total of eighty hours of recordings and eight thousand pages of transcripts, all undated). The result is WARHOLCAPOTE, the work now being given its world premiere at American Repertory Theater in Cambridge, staged by Michael Mayer (Spring Awakening) and starring Stephen Spinella (of Angels in America fame) as Andy and Dan Butler (last seen at ART as George Wallace in All the Way) as Truman. Theater buffs might recall that Cambridge was also the site of a different production about Capote, years ago, entitled Tru, featuring Robert Morse in the title role (for which he ultimately won a Tony Award), at the Hasty Pudding Theater. 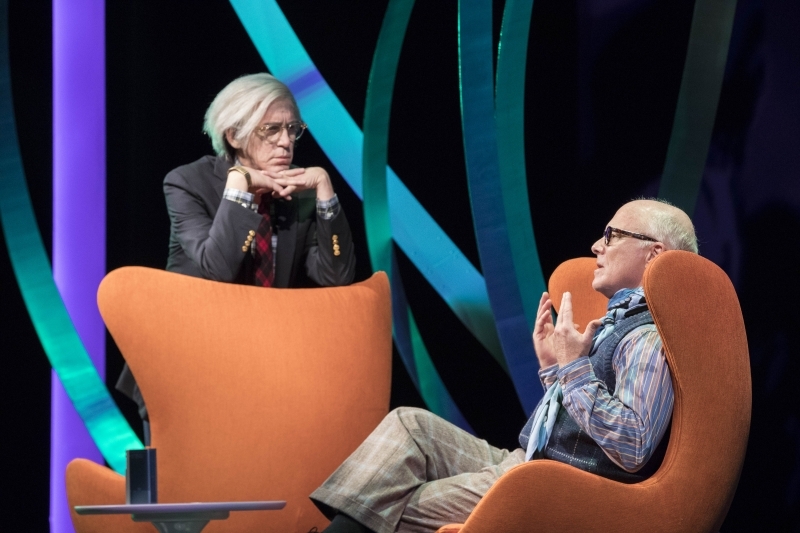 That was a one-person tour de force, but the present work is very much a two-hander, focusing on both artists, and in their own words, before their idea sputtered out; Warhol's fifteen minutes of flame? Dan Butler & Stephen Spinella in "WARHOLCAPOTE"
Roth maintains that, although the play has erupted from his imagination, every word of it is theirs, and decidedly Warhol's idea, to which Capote agreed. Roth refers to it as a “non-fiction invention” (the play's subtitle), about what the cost is of being an artist and the dangers that are inherent in becoming a public figure vulnerable to attack. He admits to uncovering the idea but rightly insists that the idea for a play originated with Warhol. Capote died before their efforts would see the light of day. (Tellingly, Warhol didn't attend the funeral, though he did make the claim that he “cared”). Roth secured the rights to develop his concept by indemnifying the Warhol foundation and the Capote estate. Bonded court report transcriptions of the tapes alone took a year. Basically, what has evolved is the chance to observe the two potential creators as they collaborated on their initial draft of their play. Their discussions about the proposed work included Warhol's view that “plot isn't important; it shouldn't have a plot” and that “art should be for everyone.” Capote's expressed view was that of treating truth in the form of fiction; he called his In Cold Blood a “non-fiction novel”. In this ninety minute work by Roth, he notes they spoke every single word but “not remotely in this way”. The rhythm and cadence of both creative sources often come through, as when Warhol bemoans his loneliness (“I go home, and I'm happy to see a roach”) or celebrity (“everybody should be bugged and photographed all the time”) or when the flamboyant Capote wasn't reluctant to go on television and be what was described as “eccentrically gay” or insincerely humble (“I'm gonna tell you what it feels like to be a genius”). Director Mayer has stated his intention to veer away from naturalism to the abstract, which would have undoubtedly pleased Warhol. Here there are several scenes, (effectively delineated by Lighting Designer Kevin Adams and Sound Designer John Gromada, as well as Projection Designer Darrel Maloney) from public (Studio 54, then a restaurant) to private (Warhol's study, Capote's home), showing how fame drew them together, both as friends and contemporary artists. Each internalized his celebrity status as well as his art. As one remarks, they are true “performers”. As such, each sets up a facade making it difficult to grasp anything about their personal lives beyond their vapid celebrity. Though the striking Scenic Design by Stanley A. Meyer and pertinent Costume Design by Clint Ramos add some context, the work's success rests squarely on the shoulders of the two actors. Butler captures the Southern twang of the gossipy novelist for a substantial amount of the proceedings (remarkably, considering his last-minute replacement in the role), but it's Spinella who uncannily inhabits his role, recreating the artist's flat lack of tone and his childlike demeanor. They deliver a few real zingers (some of them, especially those from Capote, familiar from frequent television guest appearances), but leave one in the end wondering whether to invite these two self-absorbed celebrities to spend time with us, given their celebrated off-putting self-absorption. This probably will depend on whether one shares their fascination with themselves. Born in1924, Truman Streckfus Persons died at 60 of liver cancer in 1984; born in 1928, as Andrew Warhola, Warhol died in 1987 of complications from gall bladder surgery. The question is, was Warhol correct when he prophesied that “they're gonna make money from bashing us, and that's going to be scary”. Rather than any bashing, WARHOLCAPOTE emerges as a labor of love for Roth. You may experience what Roth has wrought until October 13th. Kate Aldrich as "The Maid of Orleans"
The Maid of Orleans, composed by Tchaikovsky to his own libretto, was the first in a series of five operas about Saint Joan being presented this season by Boston Odyssey Opera (though, strictly speaking, the next offering, Donizetti's L'Assedio di Calais, on October 26 and 28 at Huntington Avenue Theatre, will focus on the Hundred Years' War before Joan's arrival on the scene). 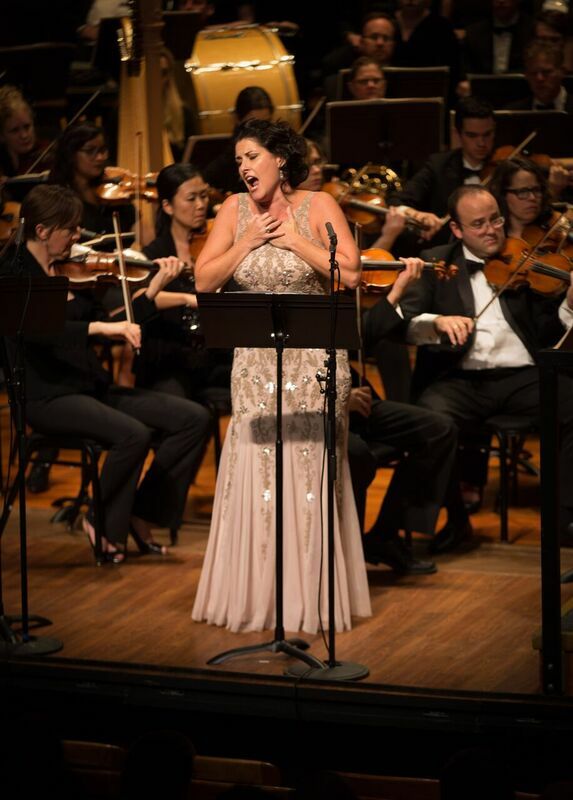 This concert production was given at New England Conservatory's Jordan Hall. Sung in Russian with English surtitles in three acts (the original third and fourth acts combined into one), it was, as always, flawlessly Conducted by Gil Rose, with Chorus Master Dr. William Cutter leading the company's chorus. Much of the life of the titular saint, such as her immolation, is incorrectly described in many works, but one, Histoire Veredique et Merveilluse de la Purcelle d'Orleans by Maurice David-Darnac, notes that in the study of history, the search for truth is what matters. Tchaikovsky based his story primarily on Friedrich Schiller's Die Jungfrau von Orleans, and premiered his operatic version at the Mariinsky Theatre in St. Petersburg in 1881. It would not be heard in its entirety in the U.S. until 1976 in Reno, Nevada. The place is of course France, and the time is the beginning of the 15th century, in the middle of the Hundred Years' War. Peasant Thibault of Arc (bass Kevin Thomas) wants his daughter Joan (mezzo-soprano Kate Aldrich) to marry Raymond (tenor Yeghishe Manucharyan), but she feels another calling altogether, predicting imminent victory for the French. Despite the courage of Knight Dubois (baritone David Kravitz), the King (tenor Kevin Ray) decides to flee. Then the Archbishop (bass Mikhail Svetlov) and various courtiers inform the king that the British have been defeated by the French, led by a maid who had a vision telling her to lead the fight. She is given command of the army, fighting Knight Lionel of Burgundy (baritone Aleksey Bogdanov), whom she cannot kill due to his handsome face. He chooses to side with the French, offering his sword to his new-found love. While the nation, including the Peasant Bertrand (bass David Salsbery Fry) and the king's beloved Agnes Sorel (soprano Erica Petrocelli) celebrate her victory, Joan's father believes her actions are the work of the devil, challenging her to prove her innocence publicly. When the heavens thunder, the people see this as a message of divine judgment and renounce her. Though Lionel tries to protect her, Joan drives him away. Alone in the woods, she is found by Lionel but their reunion is cut short by the arrival of English soldiers who kill Lionel and set up a pyre in the square of Rouen. Though the people begin to question her guilt, she is immolated, crying out to God as an angel (soprano Sarah Yanovitch) voices divine forgiveness. A small percentage of the audience committed acts of attrition as the almost four hour opera progressed; those who persevered received ample redemption for their constancy. As is the case with most grand productions (with seventy-five orchestra members, a chorus of some sixty-five singers, and ten soloists), Jordan Hall proved once again the perfect venue for an overwhelming experience like this one. Along with the wonderful orchestra and choruses, (one angelic group literally in balcony heaven), the leading roles of this seldom-produced work were all excellent, especially New England native Aldrich (magnificent in what is considered a “killer role”), well supported by all of the soloists, especially the magnetic Thompson. Next up after Donizetti's Siege of Calais, will be the company's concert performance of The Trial at Rouen, composed by Norman Dello Joio, which will be the first ever given before a live audience, as it was written in 1956 for a televised broadcast (expanded into a longer work three years later, with a different title, for New York City Opera); it focuses on Joan's interrogation and its questionable sentencing. It will also be at Jordan Hall, with an added work by Dello Joio, his Triumph of Saint Joan Symphony, in a co-production with Boston Modern Opera Project. Jeanne d'Arc au bucher by Arthur Honegger, to be performed on February 17 at Sanders Theatre in Cambridge in a co-production with the Harvard-Radcliffe Collegium Musicum, centers around the saintly peasant girl in an unusual oratorio known for its mysticism and features a non-singing actor in the title role. Lastly, Verdi's Giovanna d'Arco, more concerned with her love life, will be presented at the Huntington Avenue Theatre on April 5 and 7. With operas sung in Russian, English, French and Italian, this promises to be an elegantly programmed fifth season for Odyssey Opera. Saint Joan will surely get a deservedly warm welcome. Preview: Gold Dust Orphans' "5 to 9"
After a successful P'town run this past summer, Gold Dust Orphans brings its popular "5 to 9" to Boston September 21-24. The show will be presented in Machine, 1254 Boylston St., at the Ramrod Center for the Performing Arts. It's the story of three White House secretaries (Ryan Landry, Varla Jean Merman and Kiki Samko) and how they get even. Also featured are Larry Coen as TRUMP and Penny Champayne as Kelly Anne Conway. Performances are at 8pm on September 21, 22 and 23, and at 5p on Sunday September 24. (Tickets: 5to9.brownpapertickets.com). Prior scheduling commitments prevent the show's being attended and reviewed here, but if you're a Gold Dust Orphan fan or novice, do save one of these dates with one of your dates. Aina Adler & Ashley Risteen in "Faceless"
Faceless by Selina Fillinger could not be more timely. As the playwright states, her play is first and foremost about two adversaries, both of them young women attempting “to face their fears, find their voices, and leave their marks”. 18-year-old Susie Glenn (Ashley Risteen), a recent convert to ISIS, finds herself on trial on a charge of conspiring to commit acts of terrorism. A recent graduate from Harvard Law and practicing Muslim, Claire Fahti (Aina Adler), has been engaged as the prosecution. Each is fighting a battle “to defend their morals, motives and religious freedoms”. Thus the work becomes a treatment of identity politics, and questions of faith in a face-off between two seemingly diametrically-opposed people. The resonance and relevance of the topic is somewhat in your face, but Fillinger knows how to grab an audience's attention with her compelling (if still developing) writing style. In this play her work already shows terrific promise, though it also shows some rough edges, especially in her too frequent blackouts that result in some superficial character descriptions. Fortunately for this production, Director David Miller has a firm hand on the timing of these vignettes, and a very capable cast and crew to pull it off. His Scenic Design is simple and effective, consisting of white pillars and black furniture that create a focused playing space, and the Lighting Design by Michael Clark Wonson is precise, as is the Sound Design by Jay Mobley (including a pre-performance recording from the opera Hansel and Gretel). The Costume Design by Elizabeth Cole Sheehan is spot-on as well. For the rapid fire dialogue needed for the play, Risteen (in her best role of many for this company) and Adler (a perfect foil) are great in their “faceless” encounter. (Allusion is made to how Adler's Claire doesn't want to be the Muslim “face” in the courtroom). This voyage of self-discovery also features Susie's father Alan Glenn (David Anderson, who delivers in a rather melodramatic scene), her attorney Mark Arenberg (Robert Orzalli), who she naively doesn't grasp is Jewish despite his surname, and sixteen-year veteran prosecutor Scott Bader (Victor Shopov, in yet another gorgeously tuned performance). There is some humor (for example, Susie is referred to as “Muslim Barbie”), but mostly it's a harrowing ride with some arch text (“the only difference between a strong and a weak person is faith”, or “God can forgive me but Americans never will”). There is an overly heavy emphasis on social networking, tweeting and emoticons, too, but the playwright makes some compelling points about there being “thousands” of Susie Glenns “out there” (vulnerable to being radicalized) and one's followers being one's “family”. 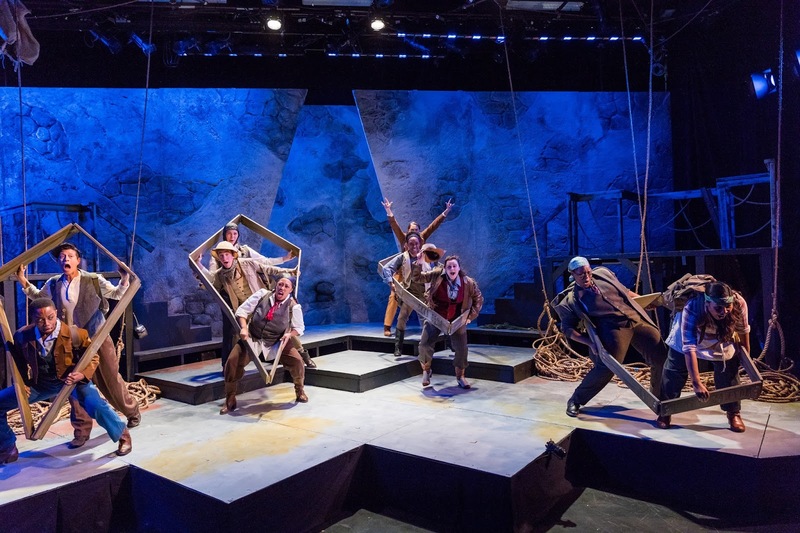 Despite these relatively minor flaws, Fillinger has produced a remarkable work for a writer who just graduated from her university (and was commissioned to create the play while still a student). You have until October 7 (at the Plaza Black Box Theater at Boston Center for the Arts) to do yourself a favor and savor the writing of an excitingly fresh voice in the theater. The two protagonists of initially opposite feminist views find unexpected depths and nuances in their ultimate face-off. 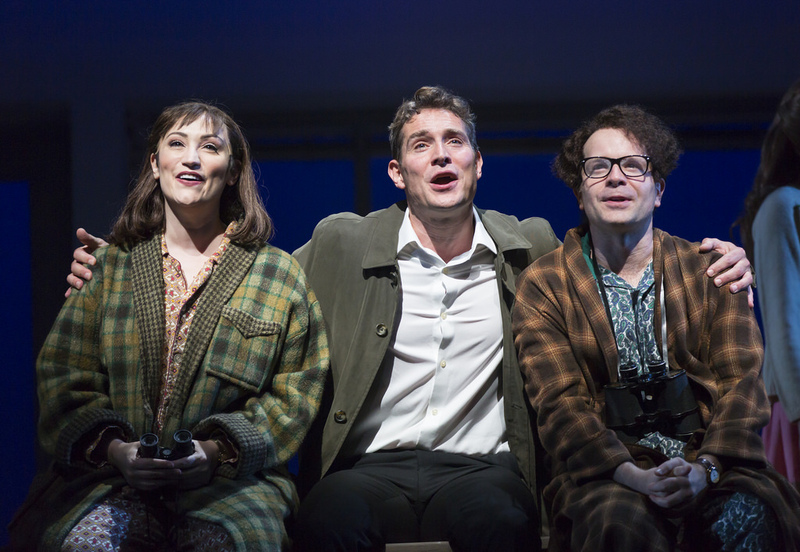 Huntington's "Merrily We Roll Along": Yesterday Is Done? Eden Espinosa, Mark Umbers & Damian Humbley in "Merrily We Roll Along"
Arguably the most eagerly anticipated piece of this season's theatrical offerings, Merrily We Roll Along might carry a precaution to fasten one's seat belt, as it might be a bumpy night; at least it used to be so, even for those of us who have always embraced this show despite its (formerly) formidable flaws. Leave it to the folks at Huntington Theatre Company to provide a resounding affirmation of the depth and dimensions of this problematic work by presenting the American premiere of the 2010 British production by Director Maria Friedman (a former actress in her directorial debut). The original New York incarnation of the work opened in 1981 and ran for a disappointing 16 performances, instantly becoming part of Broadway legend. It was revised in 1985, then even more thoroughly in 1992 (in Leicester England; now that's off-Broadway!). One of the lead cast members in Leicester was Friedman herself, who was to helm her own version in 2010, moving it to the West End of London and earning an Olivier Award for Best Musical. With Music and Lyrics by Steven Sondheim (comprising his most melodic score) and Book by George Furth, based on the 1934 play of the same name by George S. Kaufman and Moss Hart, it shares with it its source material the unconventional form of unfolding in reverse. The original musical version was deemed incomprehensible by critics and audiences alike. So the question revolving around this production was, could this musical mounting equal the company's prior successes with the likes of Candide, Jungle Book, and She Loves Me? The answer is an emphatic no. Under Friedman, this show has finally found its footing. Sondheim himself declared this version the best he's ever seen, considering the sum greater than its parts, so, as the first sung line in the musical proclaims, “yesterday is done”, and what had been theater's major problem child has now assumed its more proper place in the theatrical stratosphere. This has been a terrific Boston theater season thus far (with one exception), but Merrily is head and shoulders above all else on the current horizon. Let's not mince words; this is (at the risk of seeming hyperbolic) the finest piece of theater, musical or otherwise, of the past few decades (and, yes, that includes the phenomenal Hamilton and Dear Evan Hansen). Friedman is unquestionably a genius, with so many magical touches and underlying understanding of the material. 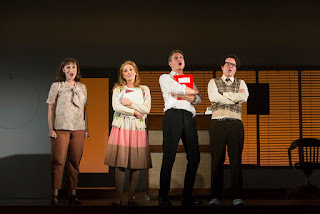 Aimee Doherty in "Merrily We Roll Along"
The story takes place over about twenty years, from 1976, backwards to 1957. It's the tale of three friends and their varied successes in their respective careers in showbiz. These central figures are Franklin Shepard (Mark Umbers), a songwriter and ultimately also a movie producer, Mary (Eden Espinosa), a theater critic (a dubious profession that! ), and Frank's collaborator in song-writing, lyricist Charley Kringas (Damian Humbley). It's worthy of note that Umbers, a Brit, and Humbley, an Australian, are joined now by Espinosa, an American, for an impressively cosmopolitan cast. Even more impressive is the range of local talent on display. The Patriots should only have a bench of such menches. First there are Frank's two ambitious wives, the ever-trusting Beth (Jennifer Ellis) and the hussy Gussie (Aimee Doherty), played by these two locally renowned veterans of countless star turns. Also of proven star power are Christopher Chew (notably as Sweeney Todd , here playing producer Joe Josephson), Robert Saoud (in multiple roles, renowned for his Tevye), Bransen Gates (a standout in Barnum), Maurice Emmanuel Parent (also in multiple roles, most recently in Scottsboro Boys), and Rebecca Gibel (a Providence Trinity Rep regular). Chew, in fact, gets to sing and sling the best line, an inside joke of a benevolent barb at Rodgers and Hammerstein's proclivity for “hummable” melodies like those in South Pacific. And then there are the three pluperfect leads, each with her or his turns that threaten to break our hearts. Umbers, Espinosa and Humbley inhabit their roles, individually and together, in performances that have to be seen to be appreciated for their indescribably definitive (there's that word again) nature in the challenges of dialogue and reverse verse. As Sondheim notes in his memoir Finishing the Hat: Collected Lyrics 1954-1981 with Attendant Comments, Principles, Heresies, Grudges, Whines and Anecdotes, content dictates form, thus frequently in this work a reprise comes long before a fully developed song, rather than the usual vice versa, sort of a reprise reprise. We also first see and hear these people as they are in 1976, deteriorated into compromise and deceit, years after their idealized expectations for the future. Thus the Old Friends section of Like It Was, a reprise, is heard later in the play in a scene set five years earlier. The most striking example of inverted history is the placement of Charley's “eleven o'clock number” at about the equivalent of eight o'clock or so, soon after the play begins; it's his solo Franklin Shepard Inc in the form of a nervous breakdown, a staple of Sondheim (Getting Married Today from Company, Rose's Turn from Gypsy or Live, Laugh, Love from Follies). Another, the hauntingly beautiful Not a Day Goes By, is initially sung ruefully by his soon-to-be-ex-wife, yet earlier in their lives (and later in the play) it's experienced as a love song. 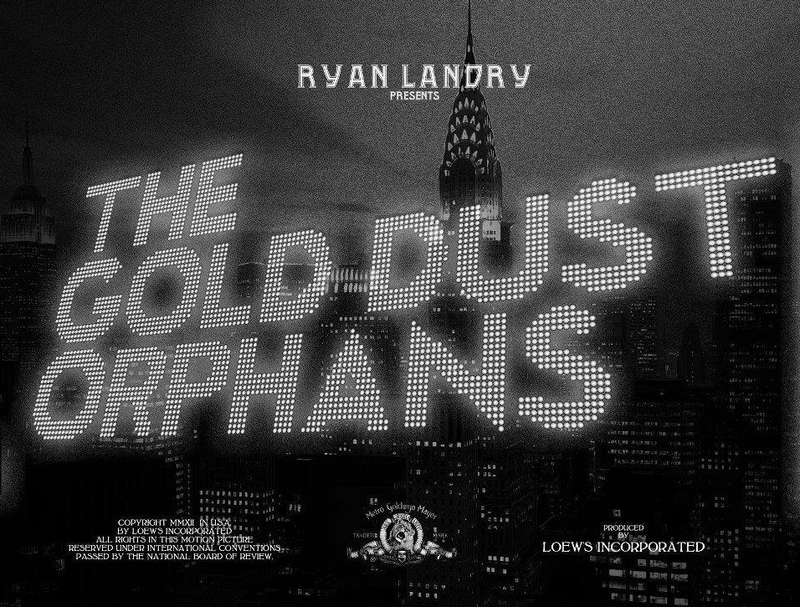 So you get the picture, and you'll find yourself aching to reach out (as Holden Caulfield did in Catcher in the Rye with his younger sister approaching the cliff of adulthood) to throttle these folks with the wrong decisions we know they're going to make. Part of its appeal is that, like all good mystery stories (as Hitchcock knew best), the audience knows more than the protagonists. We begin with the known future and look to discovering the past and finding out how they started out on this journey. 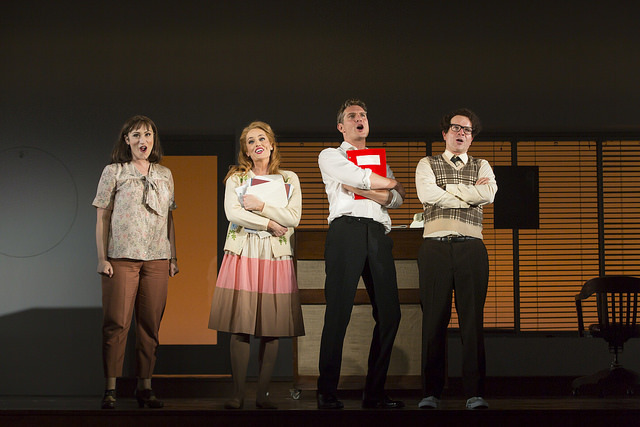 Eden Espinosa, Jennifer Ellis, Mark Umbers & Damian Humbley in "Merrily We Roll Along"
A significant problem for the show has always been that we thus meet the main character of (the older) Frank as unsympathetic, arrogant and an adulterer, having driven his friend Mary (obvious to everyone but him that she's in love with him) to drink. As the play progresses backwards we grow to see the bad choices he made, torn between decisions, making the wrong ones, leading to frayed friendships after earlier and happier memories. The team of Shepard and Kringas had some initial success with a topical off-Broadway revue, Bobby and Jackie and Jack, and their first Broadway show, Musical Husbands. Their optimism is reflected in the song Opening Doors, which Sondheim admits reflects his own early career, its stages, spurts, and struggles. The cast handles this challenge with aplomb. They're ably abetted by the the creative contributions, including Choreography by Tim Jackson (repeating his London work), Scenic and Costume Design by Soutra Gilmour (also repeating from the London version, with wonderfully awful depictions of styles over the two decades of the story and a fabulous ever-changing set rife with topical allusions like a Frank Stella piece), pitch perfect Music Direction by Matthew Stern, wondrous Lighting Design by Philip S. Rosenberg, and riveting Sound Design by John Shivers and Kevin Kennedy. It's easy to see why Sondheim and many others consider this version to be definitive, in its treatment of humanity, friendship and, as Friedman puts it, “above all, joy”. 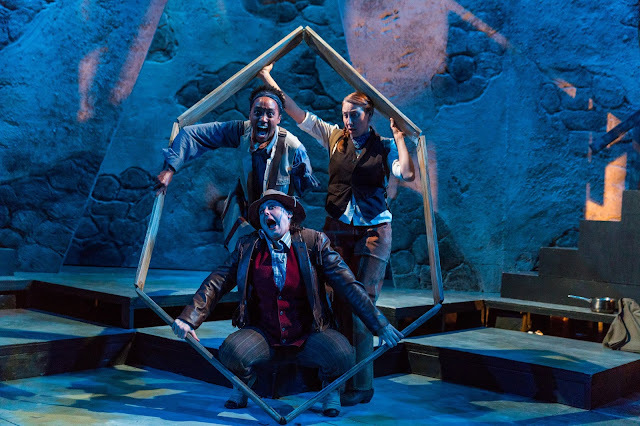 There is love and connection, and notable dramatic logic, in its nine scenes portraying this tale that is both tragic and hopeful in its discerning of dreams. She notes its “blending of opposing themes” and how the “outside world can grab you away from simple relationships, loyalty, honesty...we see how precious they are if you let them go”. The show remains a unique hybrid, both very funny and very sad. These characters are depicted first as cynical and jaded, while by the end of the show they're seen as buoyant and hopeful. It's a verbal and musical roller coaster of a theater piece, finally achieving the masterpiece status that had been just out of reach. One may cry at its hopeful and optimistic moments as well as its sadder but wiser ones, but when did you last find yourself crying because a theater work was so profound, and profoundly beautiful? As Sondheim prayed in his earlier work, The Frogs: “Gods of the theater, smile on us”, and so for Merrily they have, at last. It's the unqualified hit of the past few decades, and will be rolling along through October 15 (though, if there's any justice in the world, it will have a future as well). Miss it at your peril. Nael Nacer & Marianna Bassham in "Constellations"
Constellations by Nick Payne, premiered in London in 2002, is currently being produced by Underground Railway Theater as part of the Catalyst Collaborative @ MIT, presented at Central Square Theater. It's about one relationship, with infinite possibilities. It's also about free will, love and friendship, honey and quantum physics. It's also about seventy-five minutes. It's not the first such treatment; Woody Allen's movie Melinda and Melinda and the stage musical If/Then both mined this proposition, as did the 1923 novel by H. G. Wells, Men Like Gods, and the more recent film Interstellar. Even poet Robert Frost had his say about a road not taken, but we're not dealing with a binary choice or chance here. This play begins with a discussion by Marianne on the impossibility of licking the tips of one's elbows which may hold the secret to immortality; there are three variations on what then transpires. The script notes that an indented rule indicates a change of universe. It then proceeds to deal with such weighty issues as string theory, relativity and quantum mechanics. Whew. Fortunately, it brings us back to earth with more accessible cosmology, and alternatives that might have been that you sometimes relive in your mind. As Marianne puts it, “every decision you've ever and never made exist in an unimaginably vast ensemble of parallel universes”, or multiverses. Their verbal interactions illustrate how communication is, inevitably, imperfect, and how especially words, equally inevitably, fail us. Payne dismisses words as being capable of binding two people together “forever”; time, he posits, is a more effective breaker of hearts than conflicted human beings themselves are. And time is symmetrical. The efficacy of Constellations, a two-hander multiverse, is crucially dependent on the starring actors rewriting their destinies, and Bassham and Nacer illuminate the complexities of their roles. They're exquisitely matched, literate and surprisingly funny. Equally effective in conveying multi-layered worlds are the work of Scenic Designer Susan Zeeman Rogers, Costume Designer Charles Schoonmaker, Lighting Designer Jeff Adelberg, and Sound Designer Dewey Dellay. Lastly, one might contemplate the three quotations in an epigraph to the script. First is from Steven Weinberg in The Elegant Universe: the “reductionist worldview...(though) chilling and impersonal (is) the way the world works.” Then there is John Gray in The Immortalization Commission: “Science continues to be a channel for magic, the belief that, for the human will, empowered by knowledge, nothing is impossible”. Finally there is Peter Arkins in On Being: “The question of the purpose of the universe is the invention of human minds and has no significance, except for the way that it (illustrates) the psychology of scholarly pursuit and of the pursuing scholars themselves...there is a considerable grandeur in the presence of our spectacularly majestic universe just hanging there, wholly without purpose.” The playwright does propose that if our purpose is not to choose but to adapt, there can be a happy ending. Constellations will be illuminating us through October 8th. One of you should surely see it at least once. SpeakEasy's "Men on Boats": See-Worthy? The Cast of "Men on Boats"
Men on Boats, a 2015 startlingly comic play by Jaclyn Backhaus, explores the infamous 1869 expedition of the Green and Colorado Rivers, and what would become known as the Grand Canyon, led by John Wesley Powell (Robin JaVonne Smith), a one-armed Army major cartographer, topographer and military engineer who had lost most of his right arm in the Battle of Shiloh. It was his intent was to map the region. The play is based on Powell's The Exploration of the Colorado River and Its Canyons (his work that historically contained some alternate facts and had points of view other than his omitted). Employing period attire, morals and mores, but contemporary vernacular of our century rife with hilarious anachronisms, in several senses of the term, Men on Boats is a real trip. In just ninety minutes, the ten-member cast binds a spell. Along with Smith in the lead role, the cast includes O.G. Howland (Lindsay Allyn Cox), printer,editor, hunter; Hawkins (Ally Dawson), cook, Civil War soldier; William Dunn (Veronika Duerr), hunter and trapper; John “Jack” Colton Sumner (Bridgette Hayes), hunter, trapper, Civil War soldier; Hall (Alice Kabia); Powell's slightly challenged brother, “Old Shady” (Mal Malme), Civil War captain; Frank Goodman (Cody Sloan), British adventurer; Bradley (Hayley Spivey), Civil War lieutenant, alternate chronicler of the expedition, and Seneca Howland (Ellie van Amerongen), cartographer. There are also Mormon and Native American characters, but to describe their roles would be to give too much away. In four small boats, named No Name, Maid of the Canyon, Kitty Clyde's Sister and Emma Dean (the last named after Powell's wife), they braved the unknown. You are forewarned by Powell at the beginning of their trek: “We're on the river now, crew; there will be churning, there will be swells. Keep your bearings.” All ten of these performers are at the top of their games, with not a clinker in the bunch. And that goes for the creative team as well. Robin JaVonne Smith, Bridgette Hayes & Veronika Duerr in "Men on Boats"
The creative contributions include ingenious Scenic Design by Jenna McFarland Lord, apt Costume Design by Rachel Padula-Shufelt, terrific Lighting Design by Daisy Long, and clever Sound Design by Elizabeth Cahill. One might have observed by this point the dominance of gender-bending in the team, including the Stage Manager (Samantha Layco) and Assistant Stage Manager (Katherine Humbert). As the playwright states in the script, she is writing for “racially diverse actors who are female-identifying, trans-identifying, gender-fluid and/or non-gender-conforming”; she in fact chose to prohibit cisgender male actors from playing these characters, for a reason. Thus as they traverse the rivers, it becomes more of a transversal as they rewrite their story. The trek was the subject of the largely forgotten 1960 Disney film Ten Who Dared, a more traditional treatment of the three month discovery by the first Europeans of the canyons. Powell described the land as having insufficient water for farming (and was proved correct years later in the Dust Bowl tragedy). In the background lurk the attitudes of privileged and entitled people of European descent toward presumed native savagery and barbarism which “civilization” was meant to conquer, and the concept of “acculturation”, psychological changes that were anticipated by cross-cultural imitation. This may sound heavy, but in the forefront is just plain fun, in what is perhaps the most creative production in many a season. The descent over the perilous rapids and especially the waterfall alone, and the obvious awe evidenced by the crew's first view of the great canyon walls (which they never took for granite) is reward enough for any audience. The wonderful Director Dawn M. Simmons notes the work's “playfulness” with history (herstory?) and the playwright adds that she intentionally hands over the responsibility to the audience of the duty to tell the story the way we want to hear it, to imbue it with our own perceptions. Its unorthodoxy is just part of the wonder and originality of this unforgettable work. You may share the journey from now through October 7th and pause and ponder, just how manifest was their destiny? Once again under the ArtsEmerson umbrella, the Canadian troupe known as the 7 Fingers, fondly remembered for Cuisine and Confessions in the summer of 2016 is/are back, this time with a production entitled Reversible. This show, in its U.S. premiere, features eight virtuosic performers traveling through time and space in an effort to honor their forbears, demonstrating the poetry of the human form, linking the ending of each turn with the beginning of another in a display of continuity from one age to another. As is their practice, they utilize music, dance, theater, illusion and of course acrobatics, all dedicated to generations past on the theory that they might just have had the clue to a better tomorrow. The cast was first sent to check out their own genealogies, since today we are uprooted and not as connected to family history as were our ancestors. The initial spark was the idea of working with walls (not the international kind), since who we are on the inside is not the same as who we are on the outside. It became a very organic exercise, full of athleticism, grace and whimsy. Directed, Written and Choreographed by Gypsy Snider, with Music Direction by Colin Gagne, this is one of the company's typical team efforts. This team, of eight players rather than seven (which actually refers to the seven founders of the company), consists of almost two dozen segments. It begins with a prelude, then a piece involving lost keys and some outstanding handstanding (Maria del Mar Ryes Saez), a fans and whips dance, hoop and window diving, hula hoops (Emi Vauthey) and hat juggling, German wheel performing (Julien Silliau), aerial silk feats (Emilie Silliau), juggling (Natasha Patterson), teeterboard (Jeremi Levesque and Vincent Jutras), and Chinese pole (Hugo Ragetly). All were superb in their timing and execution from the moment the show began until its stunning finale ninety minutes later. 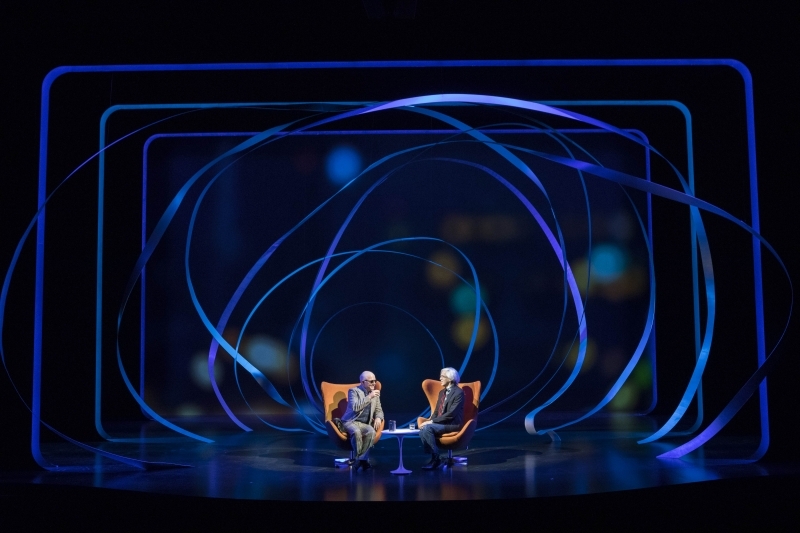 The creatives are equally impressive, from the Set and Props by Ana Cappelluto, to the Lighting by Yan Lee Chan, and Costumes by Genevieve Bouchard. Founded in Montreal in 2002, the company's goal is to create, through cooperation as well as solidarity, and think outside the proverbial box, by innovating, surprising and teaching on a scale with the grandeur of human beings. They do this through the various means of dance, cinema, electronic media and visual arts. Through these means, they hope to convey new perspectives on the everyday, the extraordinary things that lie hidden within the ordinary, at the same time leading audiences to question their own perspectives of reality in life, while encouraging them to reflect on their own hopes. For the last decade and a half, they have created original productions, Broadway shows (like Traces and circus acts in Pippin), numerous artistic collaborations, Olympic Games ceremonies, and immersive performing experiences. As the “Seven Fingers of the hand” are distinct yet closely united, they move toward common goals that speak of our world and our time. This was a very welcome escape from congressional hearings, hurricanes and hydrogen bombs. One could take comfort from the point of view the company itself proposes, namely that everything is reversible, including the past. Jake Murphy, Matt Ketai, Christine Hamel, Lewis D. Wheeler & Ed Hoopman in "Ideation"
The presence of a clean whiteboard, often a tool for problem-solving, portends something ominous, a sort of potential moral catastrophe, in Ideation, a play by video game creator Aaron Loeb which premiered off-Broadway in 2016. It's the season opener for New Rep in Watertown, in its Boston-area premiere. The title of course refers to the formation of ideas or concepts, in other words, brainstorming, and that's about all one can disclose without revealing significant spoilers. Despite some fundamental confidentiality issues, though, one may at least describe it as a very dark comedy, as well as a psychological thriller, about a mysterious Project Senna (for an unnamed client) for which a team of strategists for an unnamed company must come up with a solution for a morally ambiguous hypothetical that threatens to tear them asunder. The team consists of a boss named Hannah (Christine Hamel); Sandeep (Matt Ketai), a PhD in Industrial Engineering; Brock (Lewis D. Wheeler) and Ted (Ed Hoopman), both just back from a business trip to Crete; and Scooter (Jake Murphy), an intern working on his MBA, who is to take notes (on paper) and whose father is on the Board of Directors of the company. It's not long before we discover the verbal roller coaster that this play is, often perilously close to (intentionally) riding off the rails. In the first half of the play, the team's ideating quickly devolves into an ethically disturbing and horrendous psychological game, replete with corporate-speak, with its depiction of vague rules of engagement, conspiracy theories, and various rabbit holes, all percolating in a very terse and tense exercise in dispassionate logic. In the second half of this intermission-less work, matters turn more specious, more superficially plausible; the playwright coined the term “plausiating”, simultaneously plausible and nauseating. It also becomes increasingly funny, once the initial horrific nature of the conundrum is dissected. Thanks to this estimable cast, each seemingly perfect for her or his role, the audience is “in the room where (and as) it happens”, in real time. At one point, the only foreign-born member of the team declares that Americans are “entirely trusting while at the same time being so profoundly paranoid about the wrong things...just because you're paranoid doesn't mean they're not out to get you”. Though the play was written before our recent elections, it surely has relevance and resonance, enhanced by the creative elements including striking Scenic Design by Ryan Bates, carefully chosen Costume Design by Penney Pinette, stark Lighting Design by Bridget K. Doyle and sinister Sound Design by Dewey Dellay. The production is scrupulously directed by Jim Petosa, who notes in the program that we live in times that often require group-think (sometimes with unexpectedly non-benign results). At one point, a character describes their dilemma as one facing a labyrinth, an interesting aside given their just-completed trip to Crete. Questions arise, some explicitly, some implicitly, about how far one could go to accomplish a greater good, balancing one's personal beliefs with a corporation's aims, and fundamentally whether the end justify the means. It's all about trust (or lack thereof) and is strongly reminiscent of the famous Twilight Zone episode, The Monsters Are Due on Maple Street. 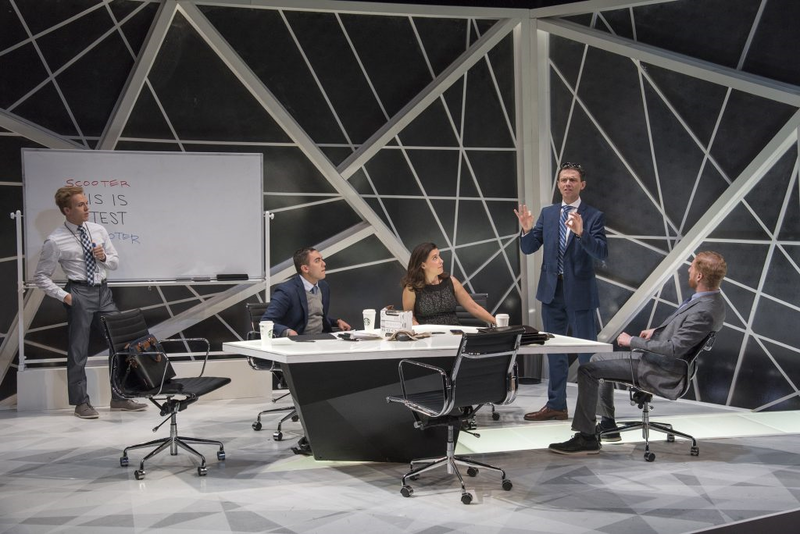 The play is a brilliantly clever conceit, at New Rep through September 24th, ruthlessly immoral at times yet hysterically involving and exhausting at others. More could be revealed, but then one might have to kill you. In Stephen Sondheim's memoir Finishing the Hat: Collected Lyrics 1954-1981 with Attendant Comments, Principles, Heresies, Grudges, Whines and Anecdotes, he describes Gypsy Rose Lee as “the burlesque queen who put the 'tease' into striptease”; no one could put it better. 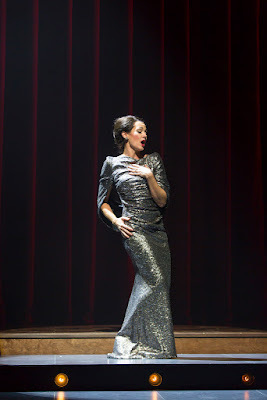 She is the title role (but not the central character) in the musical Gypsy, based on the memoirs of stripper Gypsy Rose Lee (born “Louise”) and her relationship with her mother Rose. It's the season opener for Lyric Stage Company (which will also present Sondheim's most recent work, Road Show, this coming January). Gypsy is accurately described by Sondheim as his first opportunity to write lyrics for characters of considerable complexity. The show's Book by Arthur Laurents and Music by Jule Styne portray a protagonist who is profoundly self-deluded, a real challenge for an actor as an instrument to convey considerable dramatic subtext. When it premiered in 1959, it was immediately and universally recognized as a watershed work, ran for over 700 performances and received 9 Tony Award nominations, though it didn't win any (it was the year of Fiorello! and The Sound of Music). Apart from providing many a female star in subsequent revivals with a terrific chance to shine, (such as Angela Lansbury, Tyne Daly and Patti LuPone, all Tony winners for the role), it established itself in the eyes and ears of numerous scribes as the nearly perfect piece of musical theater. What it's not, at least for the most part, is a musical comedy. Though it has quite a few funny lines and a couple of comic numbers, it remains at heart (and it has a lot of that beneath its true grit) a tragic story of wishes unfulfilled on the part of Mama, “Madame Rose” (Leigh Barrett), who wants desperately to create the success for her offspring, first her daughter June (Kira Troilo) then her other daughter Louise (Kirsten Salpini), that she herself never had as a performer. The other main character is Herbie (Steven Barkhimer), in love with Rose but not with the theater, a former talent agent turned candy salesman. As Ethan Mordden observed in his book on musicals of the 1950's, Coming Up Roses, this dysfunctional family of stage mother, favorite daughter and unloved daughter, along with the ever-faithful Herbie, is surely atypical for a musical at that time. There are a few memorable turns such as the inspired dance number by Tulsa (Brady Miller), the chorus boy with his own dreams, and the comic highpoint,You Gotta Have a Gimmick, a lesson given by three strippers to the innocent Louise, here delivered by Mazeppa (Kathy St. George, who explains she “bumps it with a trumpet”), Electra (Jordan Clark, who maintains “if you wanna make it, twinkle while you shake it”, though Sondheim preferred, but was overruled, the line “shake it till you break it”), and Tessie Tura (Shannon Lee Jones, whose stripper name is an outrageously clever musical pun). The creative team includes excellent Music Direction by Dan Rodriguez, fluid Scenic Design by Janie E. Howland (using vaudeville billing cards to denote changes of place and time, notably the reference to Omaha as terminal), and fine period Costume Design by Rafael Jaen, as well as crucial Lighting Design by Franklin Meissner, Jr. and Sound Design by Andrew Duncan Will. The entire production was Directed and Choreographed by Rachel Bertone (on a par with her wonderful work last season for Moonbox Productions' Barnum), whose dance experience greatly enhances the movement of the show, beginning with her brilliant accompaniment to the wondrous overture (not to be revealed here). As Electra might put it, she does it with a switch. Kirsten Salpini, Jordan Clark, Kathy St. George & Shannon Lee Jones in "Gypsy"
The score ranges from the hope-in-denial anthem Everything's Coming Up Roses to the plaintive ballad Small World and the jaunty Together Wherever We Go as well as the various versions of May We/Let Me Entertain You, first sung by successive children's choruses, inventively altered for a grown-up version. The “eleven o'clock number”, Rose's Turn, is still stunning theater no matter how often you've heard it before. Jule Styne was never better, and the growing prowess of Sondheim was, and remains, striking (especially in such internal rhymes as “egos”/”amigos”). About the only, and relatively minor, flaw in the work is the frequency of various permutations of Baby/Dainty June and Her Newsboys/Farmboys/Toreadorables. While it helps convey the passage of time and the increasing hopelessness of the family's rise and fall, the authors go to that well once too often. That's a small price to pay, though, for experiencing a really great show with a truly great cast. 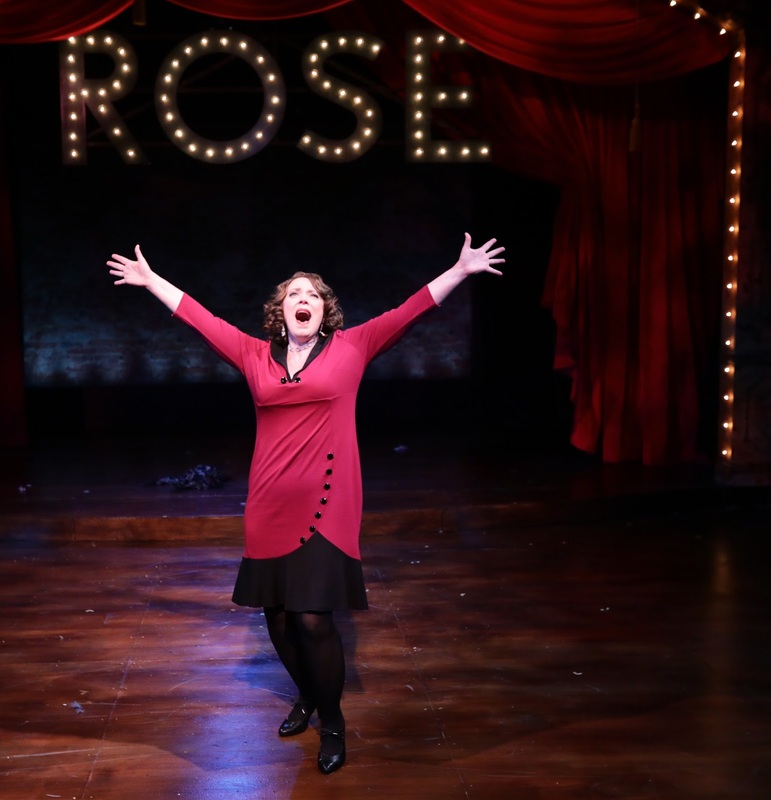 Madame Rose is arguably the finest female musical role ever written, and this is Leigh's Turn; Barrett's is a performance that sings out for superlatives, a towering apex to a career filled with memorable turns. Was there ever a more chilling entrance than her command to “sing out Louise”? Her Rose (monstrous though the character is), coupled with the initially timorous twosome of the untalented Louise and the human doormat that is Herbie, all somehow manage to make us root for them against all odds, and despite their flaws. Was there ever such a trio of difficult and demanding roles? And all three nail them. As musicals go, this is a keeper, one which bills itself as “a musical fable”. At one point, Rose proclaims that everyone needs something impossible to hope for, even as the moral of the fable might be resisting how a mother's drive can threaten to destroy her brood, virtually eating her young. So one piece of advice: between now and October 8th, by all means go, and let them entertain you! 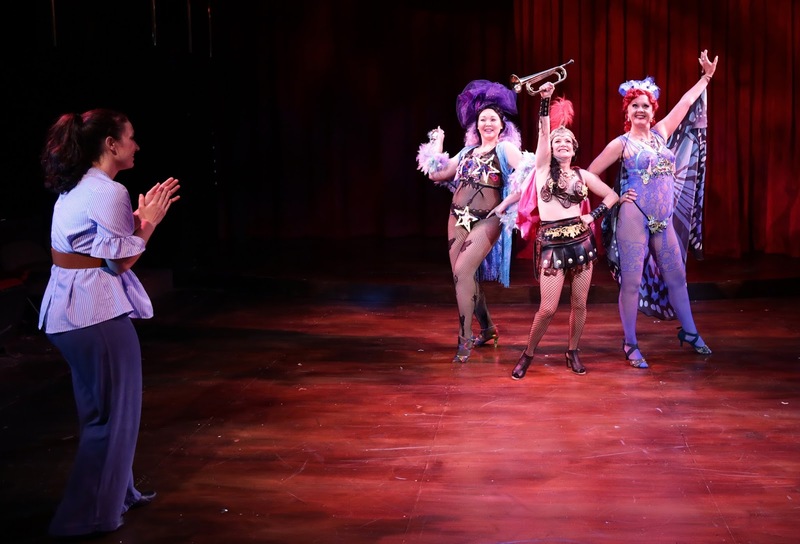 "OR": the Maiden Phoenix Company's maiden offering is at Chelsea Theater Works. Sept. 8-23.